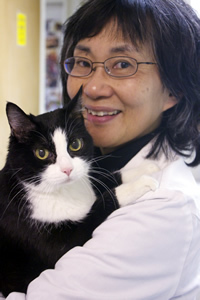 A graduate of the University of California, Davis, I have been a veterinarian for over 25 years and have been offering hospice care and euthanasia home visits since 2009. My interest in end of life care stems from my wish to help clients keep their cat in a familiar, comfortable and loving environment during this special time. I have a special fondness for cats - I admire their grace, style and spirit. In my free time, I enjoy volunteering for Fix Our Ferals, spending time with my calico Little One, hiking, traveling, and meditation. Many pets have touched my life including Nala, an orange tabby; Mocha, a tortoiseshell; Baby Sister, a stray I bottlefed; and Chin, a labrador elkhound. I was inspired to offer cat hospice because of the care my family received from my mother's hospice nurse.At each weekly visit to our home, Rosemary would listen and offer gentle, emotional support. With her help adjusting medications, my mother, one day, was able to say, "I don't have pain anymore." I will always be grateful to Rosemary for her gifts from the heart. My purpose is not to change the course of events. Death and dying are naturally sad and this may be one of the most difficult journeys to travel. Instead, my wish is to help make the most of this time by offering information, guidance and support in the comfortable, loving home environment.